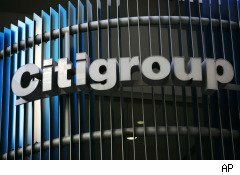 Citigroup Starts Getting On Board With the Volcker Rule: In a small victory for supporters of former Federal Reserve Chairman Paul Volcker and his eponymous rule, Citigroup has reportedly closed a $400 million "Quantitative Strategies" hedge fund that used the bank's money to play the stock market. Such proprietary trading -- in which banks make speculative investments on their own behalf, not for clients -- was a primary cause of the financial crisis, in Volcker's view. Volcker was credited with taming inflation when he ran the Fed from 1979-87, but seems to have struggled to wield real influence as chair of President Obama's Economic Recovery Advisory Board. The Volcker rule, which was opposed by banks and some GOP politicians, will soon be implemented by regulators in accordance with the president's stated intention to end the era of "too big to fail." According to Bloomberg, Citigroup (C) -- the country's third largest bank and a product of Clinton-era deregulation -- is still operating proprietary trading funds under its Citi Capital Advisors unit. A Subpoena for Goldman Sachs: In other too-big-to-fail news, Bloomberg reports that Goldman Sachs (GS) was served a subpoena Thursday morning by the Manhattan district attorney's office, relating to the firm's involvement in suspected subprime mortgage chicanery. Goldman's stock has been down 17% since Sen. Carl Levin (D-Mich.) accused the firm, essentially, of securities fraud, as well as misleading Congress. The question now is whether any executives will face criminal prosecution. At least one prominent analyst has said no -- not because they did nothing wrong, but because the shock to the financial system would be too great. Meanwhile, the firm continues to cultivate political connections on both sides of the aisle. Ratings Agency Eyes The End of 'Too Big to Fail': Moody's Investors Service (MCO) may lower its ratings of Bank of America (BAC), Citigroup, and Wells Fargo (WFC). According to Bloomberg, the ratings agency suspects that the U.S. government's commitment to support the banks will diminish as the financial crisis recedes further into the past. Will OPEC Open the Tap Wider? OPEC, the cartel of oil-producing countries, is said to be mulling an increase in production quotas for the first time since September 2007. The Financial Times reports that the twelve member-nations will discuss an increase of 1 million to 1.5 million barrels a day when they meet next week at their headquarters in Vienna. For comparison, the last quota boost was about half as much -- 522,000 barrels a day. Reasons cited for the proposed increase include production disruption from the ongoing conflict in Libya and the usual season increase in demand over the summer. But before you rejoice over a coming decline in gas prices spurred by an increase in the oil supply, consider this: OPEC members are already overproducing their official quotas -- in April, they exceeded them by 1.3 million barrels a day. So OPEC would have to mandate the maximum increase under consideration in order to truly affect the market. Brent crude was selling for $115.20 a barrel on Thursday, up 44% from last year's average, which explains why gas prices remain painfully high (despite a drop of 20 cents per gallon over the last month). Unfortunately, Forbes columnist Martin Sosnoff advises us to "Get Used to $100 Crude But Nothing Higher" for the next five years.